Directions are for size Small (2-3 years); changes for size Large (4-6 years) are in parentheses. Red Heart® Baby Clouds™, Art. E710 (6 ounce/140 yard solid; 4.5 ounce/105 yard multi skein): 6 Ounces No. 9311 Cloud CA, 4.5 ounces No. 9351 Tutti-Frutti CB, and 3.5 ounces No. 9322 Creamsicle CC. GAUGE: 7 sts = 4"; Rows 1-7 = 5" in pat. CHECK YOUR GAUGE. Use any size hook to obtain the gauge. 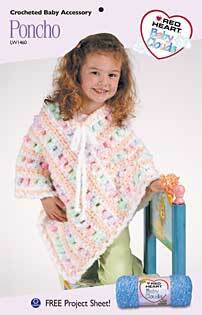 PONCHO (Make 2 pieces alike): With CA, ch 42. Row 1 (Right Side): Sc in 2nd ch from hook and in each ch across changing to CB in last st; turn  41 sc. Row 2: With CB, ch 3, skip first sc; [yo and draw up a lp] 3 times all in next sc, yo and draw through 6 lps, yo and draw through 2 lps  puff st made; * ch 1, skip next sc, puff st in next sc; rep from * to last sc; dc in last sc changing to CA; turn. Row 3: With CA, ch 1, sc in dc, sc in puff st, * sc in ch-1 sp, sc in puff st; rep from * to last st; sc in top of ch-3 changing to CC; turn. Row 4: With CC, ch 2, skip first sc, hdc in next sc and in each sc across changing to CA in last sc; turn. Row 5: With CA, ch 1, sc in each hdc across and in top of ch-2 changing to CB in last sc; turn. Row 6: With CB, rep Row 2. Row 7: With CA, rep Row 3. Rep Rows 4-7 two (three) more times. Fasten off. Piece should measure approximately 23 1/2" x 10 1/2 (13)". FINISHING: Sew short side of first piece to long edge of second piece following diagram. Then sew short side of second piece to long edge of first piece. Lower Edging-Rnd 1: With right side facing, attach CC in a corner; ch 1, * (sc, ch 1, sc) all in corner, work sc evenly to next corner; rep from * around; join with a sl st in first sc. Fasten off. Rnd 2: With right side facing, attach CA in ch-1 sp at corner; ch 1, ** (sc, ch 3, sc) all in corner, ch 3, skip next sc, * sc in next sc, ch 3, skip next sc; rep from * to next corner ch-1 sp; rep from ** around; join. Fasten off. Neck Edging: With right side facing, attach CC at shoulder area; ch 1, sc evenly around neck working a decrease over each seam area (to decrease: draw up a lp on each side of the seam, yo and draw through all 3 lps on hook); join to first sc. Fasten off. Tie: With CA, ch 100 (120). Fasten off. Weave through sc of Neck Edging. Make a knot at each end of tie. ABBREVIATIONS: ch = chain; dc = double crochet; hdc = half double crochet; lp(s) = loop (s); mm = millimeters; rep = repeat; rnd = round; sc = single crochet; sl st = slip stitch; sp(s) = space (s); st(s) = stitch (es); yo = yarn over; * or ** = repeat whatever follows the * or ** as indicated; [ ] = work directions in brackets the number of times specified.